Hallmark Keepsake Ornament. Star Wars EWOK Wicket set of three miniature ornaments. From box: Furry little creatures who live in the trees on the moon of Endor, the music loving Ewoks are peaceful, brave and loyal. A curious Ewock named Wicket W. Warrick and his friends become part of the Star Wars adventure when they aid the heroes of the Rebel alliance. handcrafted. Sculpted by Katarina Bricker. Mint in mint box, never used & from a smoke free environment. I have all the Hallmark Star Wars ornaments in case you are looking for any. 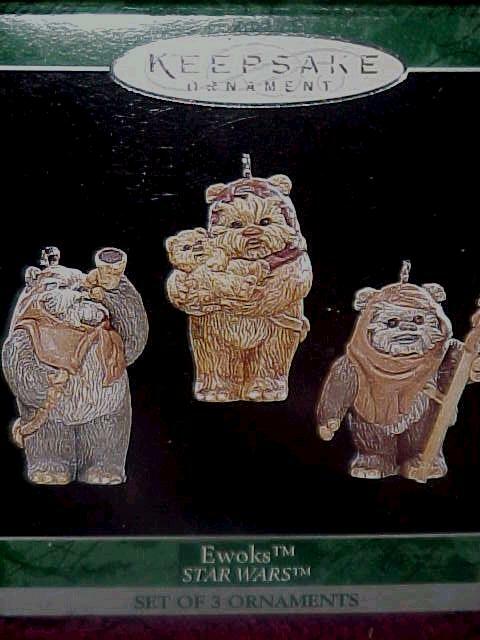 Items Similar To "EWOKS: Hallmark Star Wars set of 3 Ornaments 1998"